Paddy Fordham died in Katherine Hospital in the early hours of June 1st 2006. His family were present at his bedside. Paddy regularly painted at 21 First Street and would often sit and tell stories from his childhood. He is sorely missed. Paddy Fordham Wainburranga's paintings and carved balangjarngalain spirit figures are without parallel. The loose fluidity of line and form - in two or three dimensions - defies standard conventions. The borders of his paintings on bark and canvas are often crooked, the paint rough and unfinished but an impressive, gestural power dominates each painting. Paddy Fordham. 21FirstSt. November 2000. Paddy works with a raucous vigour on a plain background, painting vital spirit figures, writhing serpents, circles and dots without concern for symmetry, precision or minute elaboration. Although Paddy was taught to paint by his father, his art has branched in another direction and is not confined to the iconography of ritual and mythology. As a result of a lack of ceremonial status, the artist is not entitled to include country-defining symbolism or rarrk used by other Rembarrnga people. Paddy was displaced from his birth place Bamdibu (south west of Ramingining) to Beswick Station, 100 km south east of Katherine. 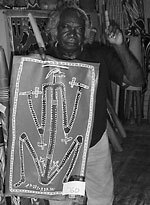 The Rembarrnga language group from Central Arnhem Land has produced some highly original art practitioners over the years, however, none has matched the thematic inventiveness of Paddy Fordham Wainburranga. As a painter with a philosophical bent of mind, Pady paints Ngalkbun Rembarrnga mythologies but also dedicates himself to recording the history of the region through a remarkable series of works produced since the eighties. Paddy's personal experiences which shaped his rather eclectic views on life, were similar in many respects to those of other men from his generation. Born in his father's country at Bandibu, between Malnjangarnak and Bulman, Paddy and his family followed many of the other Rembarrnga to the ration Depot at Maranboy during the wartime. It was later, after limited schooling at the nearby Government settlement Dandangle, that Paddy decided to become a stockman, working at various cattle stations from Mataranka to VRD, Killarney and Gorrie Station, then moving to Oenpelli, Goulburn Island and Milingimbi. By 1962 after the introduction of citizenship rights for Aboriginals, he decided to give up being a stockman and went to the recently established settlement of Maningrida to live. Nearly twenty years later he returned to live with his Rembarrnga relations at Beswick. It was here in the early 1980s that Wainburranga began committing his stories to bark. Paddy Fordham Wainburranga is included in the collections of the National Gallery Canberra, National Gallery of Northern Territory, Jinta Desert Art Gallery, Aboriginal Desert Art Gallery Alice Springs, Aboriginal Art Galleries of Australia Melbourne and many other public and private collections round the world. In 1993 Paddy's painting Eagle Hawk and Crow won the National Aboriginal art award. "No, painting won't stop. no, I gotta do that. My painting, my Dreamtime, nobody own it for me, nobody can stop this History painting. When I die, young people gotta take it over. That's why all over the world we meet up, talk together and give history to one another. I give you my painting or you give me your painting. Everything for the children because they going to be taking over." Paddy further advanced his painting skills from natural ochre pigment on bark to high quality acrylic paints on linen or canvas. He has been able to maintain his unique style without compromising his traditional iconography. Paddy's unique depiction of the Mimi Spirit is the centre piece for most of his paintings. He often paints a dancing Mimi Man, which he says is a good Mimi, he looks over the land as a protector, and only comes out at night. The Mimi is not visible during the day. Paddy always includes some small representation of the bush animals that he grew up with, many of these animals are the focal point of significant stories that were passed to him by his father. Animals such as the long and short neck turtles, file snakes, leeches, butterflies, rainbow searpent, (Bolong) and of course the mosquito which is paddy's totem and are often seen accompanying the mimi figures which Paddy depicts in his artwork. Paddy is very loyal to his tradition always encouraging younger people to paint so as to record their history and culture in art for future generations. Paddy can often be heard singing his tribal songs while he is painting. 1984 Aboriginal Art, an exhibition presented by the Australian Institute of Aboriginal and Torres Strait Islander Studies, Canberra. 1987 The Fourth National Aboriginal Art Award Exhibition, Museum and Art Gallery of the Northern Territory, Darwin. The Sixth National Aboriginal Art Award Exhibition, Museum and Art Gallery of the Northern Territory, Darwin. Contemporary Aboriginal Art from the Robert Holmes a Court Collection, Harvard University, University of Minnesota, Lake Oswego Center for the Arts, United States of America. The Eighth National Aboriginal Art Award Exhibition, Museum and Art Gallery of the Northern Territory, Darwin. The Tenth National Aboriginal Art Award Exhibition, Museum and Art Gallery of the Northern Territory, Darwin. 1993/4 ARATJARA, Art of the First Australians, Touring: Kunstammlung Nordrhein-Westfalen, Dusseldorf; Hayward Gallery, London; Louisiana Museum, Humlebaek. Malu Urul, National Maritime Museum, Sydney, Art of the Rainbow Snake, National Gallery of Melbourne. 1989 Memorial Award for Mawalan's eldest son, [Best artwork in open media] National Aboriginal Art Award, Northern Territory Museum of Arts and Sciences, Darwin. 1993 Telecom Australia Prize, $15,000 National Aboriginal Art Award, Northern Territory Museum of Arts and Sciences, Darwin. West, Margie (1994) 'Contemporary Territory'. Museum & Art Gallery of the Northern Terrtory exhibition catalogue.